I’ve had a terrible week with my baking adventures. First I burnt a cake but Yuye salvaged it, then I made chocolate brownie cookies that were all different sizes. At least my non-baked desserts turned out quite nicely. I blame it all on Yuye’s bad oven (but more probably my lack of skills). Let me explain. Yuye’s actual big oven that’s attached to the cook top broke a very long time ago so he’s been using a tiny portable oven to bake his sandwiches in. Not too long ago, that decided it’s had enough as well. So I used a Myer voucher I had to buy him a shiny new one. For some strange reason, I’ve never really baked a cake in it since I purchased it at the end of last year. If you haven’t used a portable oven before, let me tell you that it’s very difficult to control the heat. When a recipe says 180C, it’s probably only 160C according to my experiences. So when I tried baking this cake at 180C, it completely burnt the top beyond recognition. It didn’t help that there is no light in the oven for me to see what it was doing to the cake. Out of my anger and frustration, I stormed into Yuye’s room demanding a proper oven. In defence, he went over to the cake and salvaged the poor thing by scraping off all the burnt bits. The cake itself was a little dense due to removing it from the oven before it was properly risen but other than that, it was actually quite tasty. I wasn’t planning to put it on the blog just because I thought there was no way I was putting something ugly up but Yuye convinced me to anyway. So here it is, in all its glory and well…burntness. To some extent. 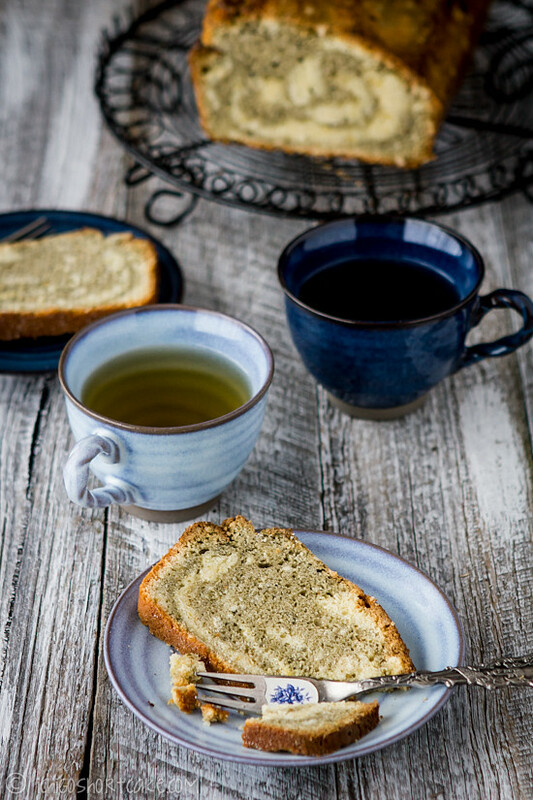 Hope that doesn’t deter you from trying this recipe out as it’s quite delicious with a cup of tea! My matcha portion looks more brown than it is green because the powder is nearing its use by date. I should buy myself a new bag since I love matcha so much! I have kept the recipe as originally written as unlike myself, most of you will probably have a conventional oven! 2. Butter and flour a 9x5x4 inch loaf pan using the 50g of butter. Shake off excess flour. 3. Sift together the baking powder, flour and salt. 4. Melt the white chocolate chips over a pot of simmering water and set aside. 5. 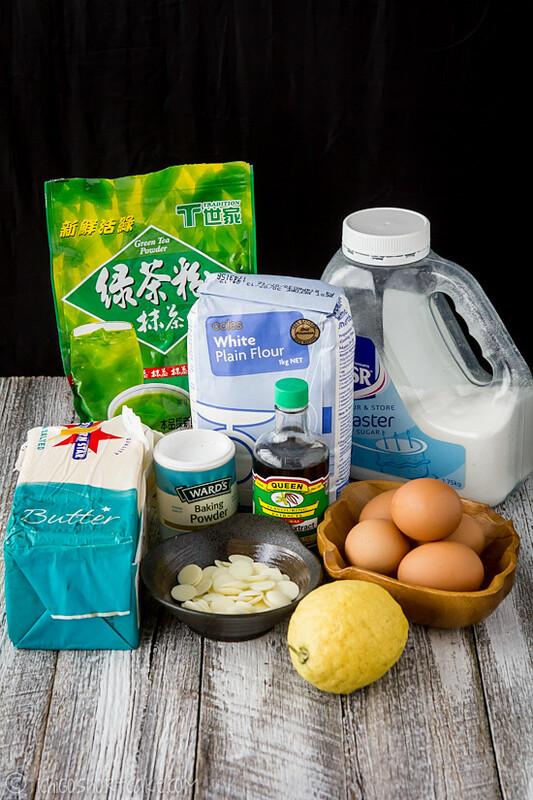 Whisk sugar, eggs and vanilla extract in a large bowl until pale and smooth. 6. Fold in sifted dry ingredients in 2-3 folds. Careful not to over mix. The batter will be thick and smooth. 7. Gently fold in the white chocolate and 130g butter. 8. Divide the batter into 2 bowls (roughly divided). Put lemon juice and zest into one bowl and matcha powder into the other. Gently mix together with a rubber spatula. 9. Pour the 2 batter mixtures a little at a time into the buttered loaf pan and run a spoon or spatula through it until you get a marbled effect. Careful not to over mix as the cake will just come out brown rather than marbled. 10. Bake the cake for roughly 55-60 minutes, sticking a skewer or knife into the centre and if it comes out clean, the cake is ready. 11. Allow to rest in the pan for a further 20 minutes outside the oven and then cool the cake on a cooling rack. 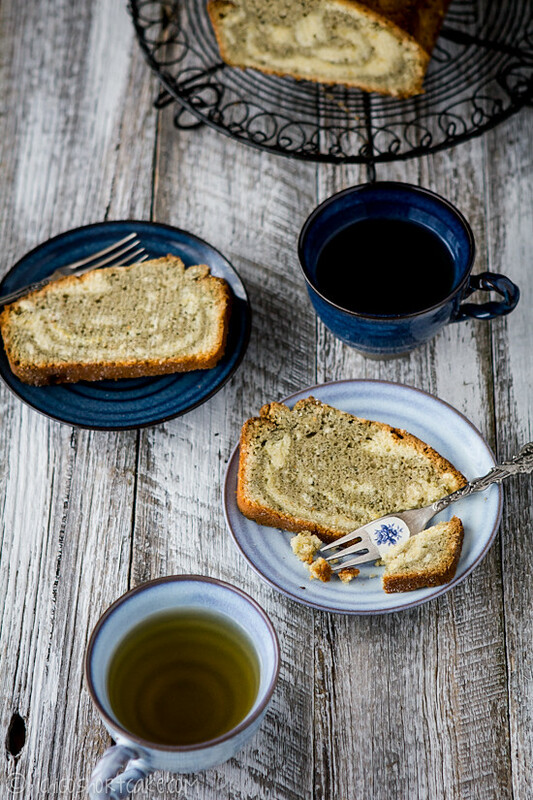 Serve with green tea for extra pleasure! Question time: Have you ever used a portable oven before? How does it compare to a regular oven in your opinion? A wonderful cake! It must taste divine. I love your teacups. Pretty. I’ve only ever used a regular oven before so can’t make any comparison… I’m glad Yuye convinced you to post it – still looks lovely :). I’m in a baking mood, so I’ll be making this over the weekend! I’m ready for a little baking, this looks just perfect! Nice photos! 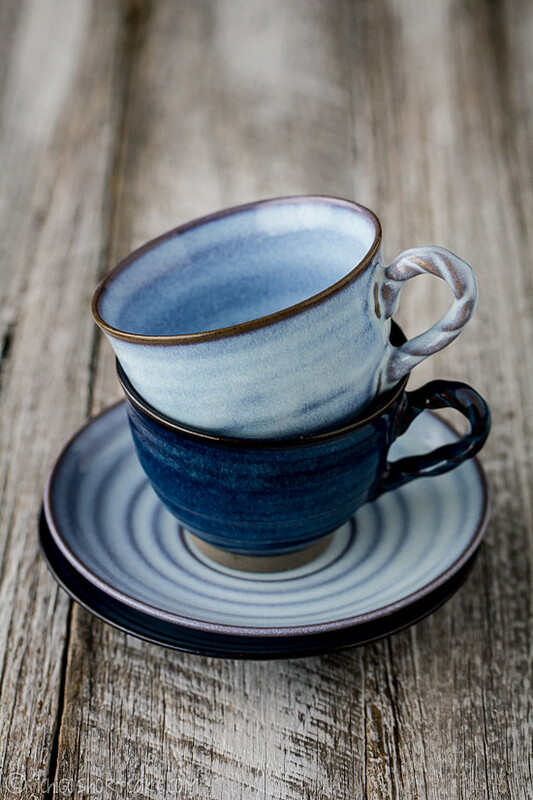 I love the tea cups, you have great sense of style. One of the glories of photography is you can always throw out of focus the things you don’t want people to look at. 😉 I wouldn’t have known you burned the cake unless you told us – it looks fine. And sounds delicious! The oven in our range is a bit dodgy, too, and even though there’s nothing “wrong” with it, we’re going to give ourselves a new one for Christmas this year. Life is too short to cook with substandard stuff. We don’t have room for a double oven, so I’ve actually been eying those portable convection ovens so we can have a 2nd one. I’ve heard good things about the Smart Ovens (I think that’s their name) but have no actual experience. Anyway, I always stick a thermometer in my ovens just because they never seem to be accurate. Just found your website and will be a regular visitor. Oh no you poor thing! I know how you feel, baking in a portable oven : ( I was doing that in HK too when I didn’t have a big oven >_< it's super hard to control the temperature and like you said with no light…you can't tell anything sigh not good! 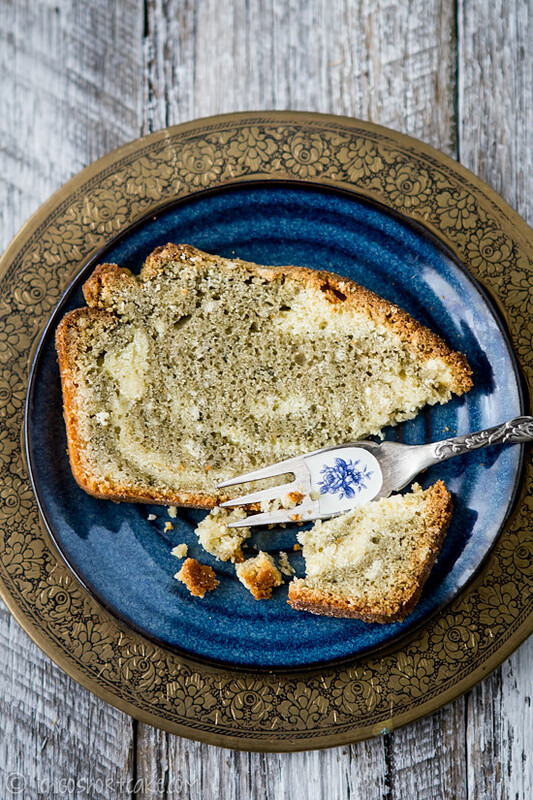 And even though you said it's burnt and it doesn't look good, I still think this cake looks delicious ~ and green tea and lemon are one of my favourite flavours so definitely going to try this recipe out soon! omg i had a disastrous cooking week not that long ago… mainly with baking too. This looks great though! 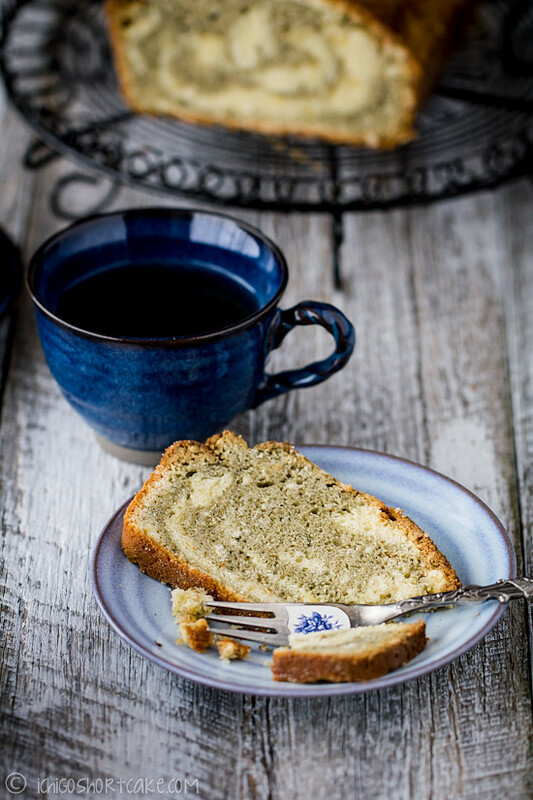 Love the look of the marble cake – it’s lovely to see something different to the usual “chocolate/plain” combo so often used in marble cakes too! It’s perfectly okay to be chatty Nami, in fact, I love it when you’re chatty! 😀 I totally agree with you, I’ve thought about it as well in the past and so figured out that doesn’t matter what recipe it is or how professional, the recipe is still just a ‘guide’ and has to be adapted in some way to individual ovens/kitchen as well as personal tastes too. Some might not like certain things as sweet or salty and so forth. It’s quite a difficult task to write recipes! Jenny, where did you get these cups and saucers? I’d love to have them myself! Thank you! I replied your other comment – they’re from Fujimart in Prahran Market. The last time I was there they still stocked it so should still be there. Glad you like them, I wish I had more of them!